Yesterday, one of the greatest sci-fi minds of the 20th center, Ray Bradbury, died at the age of 91 after a lengthy illness. His publisher, HarperCollins, were apparently the ones to break the news to the world. Best known for his seminal dystopian novel Fahrenheit 451, Bradbury quickly joined the ranks of authors like Orwell, Huxley, Clarke, and Asimov, in that he was a speculative author who’s predictions rapidly came true. Amongst such things were the emergence of ATMs, wall-sized televisions, interactive entertainment, and live broadcasts of fugitive car chases. In addition to Fahrenheit 451, he also penned the Martian Chronicles, The Illustrated Man, and Something Wicked this Way Comes, and over 600 other works of fiction, articles and essays. As such, his influence and legacy are truly immeasurable. This dystopian piece of speculative fiction takes place in the late 20th century, when American culture has degenerated into a form of brutal escapism. Nuclear war looms on the horizon, books have been banned, and for the majority of people, cocooning in their homes in front of their wall-sized monitors seems like the perfect distraction. The story takes place from the point of view of a Fireman named Guy Montag, who’s job consists of located offenders and burning their books. This is the role of firemen in the future, who instead of fighting fires are responsible for starting them. Montag is unhappy with his life and suffering from a deep sense of disquiet. Until one night when a young woman named Clarisse shakes up his worldview. Whereas most people in Montag’s world seemed numbed and dead, she is vital and alive, and questions just about everything. Shortly thereafter, she dies in a tragic accident, which shakes Montag’s world up even more. He too begins questioning the rules, he steals books from jobs he is meant to pull, and begins reading them. Realizing he is now in violation of the law, he seeks out other offenders for answers. This brings him into contact with Faber, a former English professor that Montag knows can help. In time, Faber is convinced to bring him into this confidence and reveals that he is part of a circle that is dedicated to the preservation of written knowledge. Eventually, Montag is found out and must flee. His boss, it seems, has known for quite for some time what he is up to but extended him some courtesy because he knows what he’s going through. More enlightened than the average person, Montag’s boss explains to him why books have been banned and why they must destroy them. Rather than the result of forced censorship, the process was entirely voluntary. People chose mindless entertainment, distraction and fast cars over reading, reflection and learning. Montag’s escape from his house and the police becomes the subject of the evening news. He manages to elude the authorities and meets up with the reading circle down by the river. Interestingly enough, he flees the city just in time to witness being destroyed from a nuclear attack. It seems the build-up to Armageddon has finally ended and nuclear war has come. Montag leaves with the group, who’s mission now has become one of preserving civilization as well as literature. What was enduringly brilliant about this book was not so much the predictions about technology or the emergence of book banning, but the reasons for it. Capturing the zeitgeist of his age, Bradbury essentially felt that a shocked and fearful society would seek escape by the most convenient means available to them. And whereas most dystopian novels involve ignorance and illiteracy being forced by a brutal regime, Bradbury believed that the process would be entirely voluntary. In this respect, he captured the same essence as Huxley, another dystopian critic who believed man’s appetite for distraction would be it’s undoing. Though written before Fahrenheit 451, the MC gained notoriety more slowly, but eventually became recognized as one of the great works of science fiction. A collection of loosely based stories rather than a single novel, the book follows the future history of colonization on Mars, dealing with all kinds of speculative, existential and scientific questions. The overall structure of the book comes in three parts, punctuated by two catastrophes. The first is the near-extinction of the Martians, while the second is the parallel near-extinction of the human race. 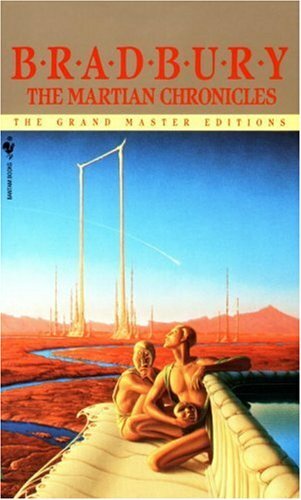 In first part of the book takes place at the end of the 20th century and details mankind’s efforts to reach Mars, and the various ways in which the Martian natives keep them from returning. However, towards the end (in the story “—And the Moon be Still as Bright”) it is revealed the majority of the Martians have died as a result of a plague brought from Earth. This opens Act II, taking place in the early 21st century, where humans begin colonizing the Red Planet. On occasion, they have the opportunity to make contact with the surviving Martians, but mainly are concerned with building a second Earth. However, many settlers begin to pack up and leave as looming nuclear war on Earth causes them to want to get back and be with their families. The outbreak of this war signals the end of Act II and the opening of the third act. In the third and final act of the book, all contact has been lost with Earth when the nuclear war takes place. As the war passes, those humans who have survived on Mars have began building a distinct civilization and having children who have only known life on the Red Planet, effectively becoming Martian themselves. This prospect allows the book to return to its beginning, as it is suggested that new waves of colonists will soon be coming and conflicts are likely to emerge as a result. This book was not only brilliant in that it addressed a great deal of scientific and existential questions that are sure to come when actual colonization begins (if ever). It also managed to capture a sense of timeless truth and lessons which come from real history, or the “Age of Discovery” as its known. These included the destruction of native inhabitants, the push-pull factors which lead to colonization, severance from the homeland, and eventual adaptation as new people begin to embrace the new environment as their home. Much like KSR’s Mars Series, this book should be required reading if ever any Ares missions get underway! “The Veldt” – in this story, we see a family who’s children have become terribly attached to the houses’ high tech nursery. Like a holodeck from Star Trek, the children use this to create virtual environments – in this case, the predatory environment of the African veldt. When the parents threaten to take it away, the children lock them inside and they are apparently consumed by the lions. thought it is not outright said, it is implied that the children have reprogrammed the unit to become real and have been “feeding” people to it for some time. “The Other Foot” – in this exercise in turnabout, we learn that Mars has been colonized solely by people of African descent. When they learn that a rocket is coming from Earth with white travelers, they decide to institute a system of racial segregation similar to that of the Jim Crow Laws of the American South, in retaliation for the wrongs of history. However, when the rocket lands the traveler tells them that most of the Earth has been destroyed in a nuclear war and the people realize that discrimination is harmful in all its forms. They rescind their discriminatory laws and welcome the new crew as equals. “The Man” – A group of space explorers land on a planet to find the population living in a healthy state of bliss. Upon investigation, they discover that an enigmatic visitor came to them, who they eventually conclude was Jesus (or some other religious persona since He was never named). Some decide to spend the rest of their days rejoicing with the natives, while another decides to continue on in his spaceship in the hopes of catching up with this person. While he spends the rest of his days in hot pursuit, always one step behind and never quite catching up to him, the other learn that “he” is still on the planet with them. Hello metaphor! “The Exiles” – taking a page (no pun!) from Fahrenheit 451, this story revolves around the concept of burning books and the immeasurable nature of knowledge being lost forever. It begins with stating that numerous works of literature have been banned and burned on Earth. The fictional characters of these books are portrayed as real-life entities who live in a refuge on Mars. These characters are vulnerable however since once all the books on a character are destroyed, that character vanishes permanently. When the group of characters learn that some people are coming for them, they stage a counterattack, but are foiled by the astronauts who burn the last remaining books from Earth, unknowingly annihilating the entire colony. “Marionettes, Inc.” – A man attempts to escape his marriage by replacing himself with a robot to fool his wife into thinking he hasn’t left and tells a friend about it. The man comes back and tells the robot to go back into the box, and the robot disobeys him saying he has fallen in love with the wife. The robot then proceeds to put the man in the box and replaces him for real. Sound familiar? “The Illustrated Man” – The namesake of the book, this story involves an overweight carnival worker is given a second chance as a Tattooed Man, and visits a strange woman who applies skin illustrations over his entire body. She covers two special areas, claiming they will show the future. When the first is revealed, it’s an illustration of the man strangling his wife. Shortly after this comes to pass, the carnival workers run the man down, beat him, and look at the second area, which shows an illustration of the same beating they are doing. Can you say self-fulfilling prophecy? Most of these stories would probably sound familiar in one way or anther, but that’s because they’ve been adapted, copied and referenced by countless pop culture sources. 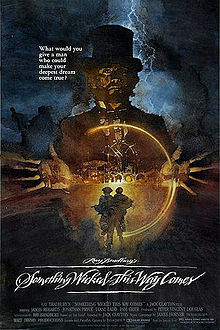 I myself recall watching “The Veldt” in school and being chilled by its eerie and dystopian tone. 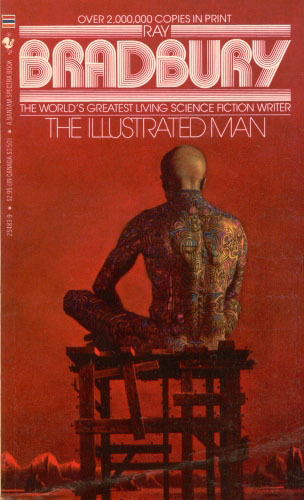 “Marionettes Inc.” has been adapted into comedy format numerous times, and the theme of prophecy and fulfillment in “The Illustrated Man” has inspired countless stories, not the least of which are The Butterfly Effect and perhaps even PKD’s Minority Report. A somewhat off-beat work for Bradbury, who’s works consist mainly of speculative sci-fi, this fantasy/horror novel has nevertheless become a household name for fans of the dark and weird. Set in modern a day Midwestern town, the story revolves around a visiting carnival and its mysterious director, Mr. Black. Enter into this the story’s protagonists, two 13 year old boys, Jim Nightshade and William Halloway, who witness the arrival of the carnival and become immediately enthralled with it. They quickly realize that everyone who works there has been lured into Mr. Dark’s service through the promise of being able to live out their fantasies. For most people, these involve become younger, a gift he confers on several characters through his “magic” carousel. In time, they come to realize that Mr. Dark holds these people under his sway and has a tatoo of each of them on his body, a symbol of his control. Charles Holloway, William’s father, looks into Mr. Dark’s past and realizes he can be defeated through love. It is unclear what this entails, but after the boy’s are kidnapped, he comes to the carnival and begins destroying it’s structures and Dark’s protectors by expressing laughter and joy. He and his son use the same tactic to eventually bring down Mr. Dark and bring Jim back from death, who was stuck on the carousel and rapidly aging. Though different from most of his other works in terms of genre, this story did contain many elements which were present in his other stories. For example, the concept of the carnival and the tattooed man was the basis of “The Illustrated Man”. The nostalgic feel of the story was also to be found in his novel Dandelion Wine, and is often paired with this novel as presenting both the lighter and darker sides of childhood. And of course, the novels resolution, where good prevails through purity of heart, is to be found in many of Bradbury’s works. Because of its focus on good versus evil, childhood, and coming of age, this story was to have a profound effect on several authors, the most notable of which is Stephen King. Citing Something Wicked as his inspiration, King attributed a debt to Bradbury for helping to write It and Dreamcatcher. In the end, Bradbury was known for many things: originality, depth, vision and genius. But the thing that sticks with the most about him was his views on the preciousness of literature and knowledge. Basically, he expressed several times over how when something is lost, it’s lost forever. I can only assume then that he would take great comfort in knowing that he left the literary legacy that he did. Though he may no longer be with us, his works will live on and serve to inspire many generations to come. So than you, Mr. Bradbury, for your many, many contributions. You did it right, and now you go on to join the other greats of your time. Rest In Peace. 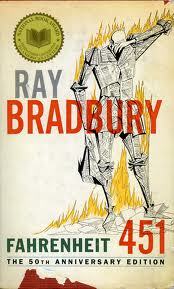 F451 was the first and only Bradbury book I’ve read. He was brilliant. 91 years is a long time. He was brilliant. There’s not much more we can say than that. Although we’ll try to do him justice, I suppose. When your heroes die, all you can do is reread their stuff and bask in the awesomeness, maybe hope to be that amazing. Throws you a curveball, doesn’t it? I wonder if Fahrenheit 451 could be considered “NooK” or “Kindle.” Hmmm. So sad. Ray Bradbury just died. This is a great post on his life’s work. 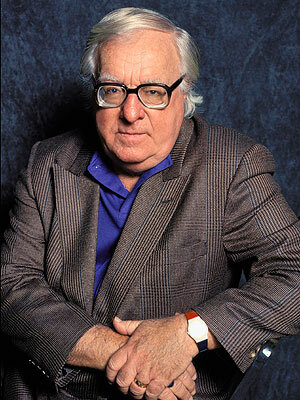 RIP Ray Bradbury, he will be missed.